There are some great events for the Western-minded soul in Edmonton during Farmfair and the Canadian Finals Rodeo this fall! We’ve rounded up some of the highlights of this year’s events to help you make your plans to see (and do!) all you can while in the Cowboy Capital! November 1 | 7:00 p.m.
November 3 | 2:00 p.m.
Congratulations to this year’scontestants in the 60th anniversary Miss Rodeo Canada pageant. We wish you all the very best of luck! November 4 | 12:00 p.m.
? Features a wealth of restaurants competing for the revered title of Edmonton’s Best Chili. November 5 | 11:30 a.m.?–?2:00 p.m.
? Proceeds to Edmonton Food Bank. November 4 | 7:00 p.m. – 10:00 p.m.
November 5 | 2:00 p.m. – 4:30 p.m NEW TIME! November 6 | 2:00 p.m. – 4:30 p.m NEW TIME!
? This must-see event features the cowboys from sixteen working ranches from across Western Canada competing for honours using traditional ranching skills transformed into exciting events. The team events include Sorting, Branding (with paint), Doctoring, Wild Cow Milking and the Wild Horse Race plus the ever-exciting Bronc Riding. November 4 | 3:00 p.m.
November 5 | 11:00 a.m. – 12:00 p.m.
November 5 | 5:00 p.m. – 7:30 p.m.
? The Northlands Stock Dog Competition is a heart-pounding timed event where stock dogs maneuver sheep through obstacles then herd them into a pen. Only able to communicate with their dog through whistles or voice commands, the handler must stand in a designated area until the last sheep exits the chute. This is a true showcase on the partnership between the handler and their dog! November 5 – 6 | 10:00 a.m. – 7:00 p.m.
? 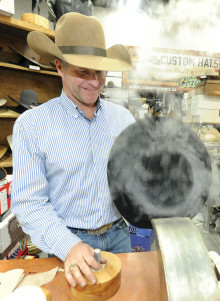 For two days only, some of the finest traditional cowboy artisans are offering their custom horse gear. Featuring bit makers, silversmiths, saddle and gear makers, rawhide braiders and horsehair hitchers. November 5 – 9 | 10:00 a.m. – 7:00 p.m.
? Boots, chaps and cowboys hats — plus a whole lot more of Western shopping! 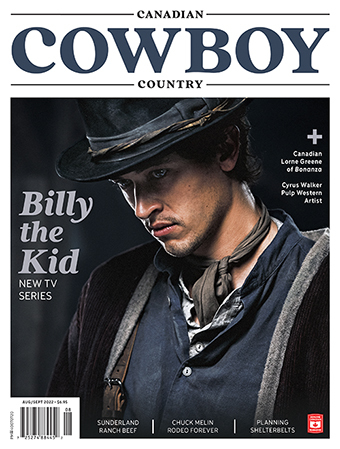 Be sure to stop by the Canadian Cowboy Country magazine booth, renew your subscription and have a visit. November 5 – 7 | 7:00 p.m.
November 8 | Matinee 1:00 p.m. – 3:15 p.m.
November 8 | 7:30 p.m. – 9:45 p.m.
November 9 | 1:00 p.m. – 3:15 p.m.
? 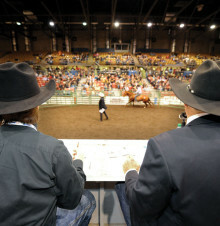 The CFR is professional rodeo action at its finest! Enjoy the extravagant openings, hilarious entertainers and of course, the raw excitement as competitors ride hard to earn the gold buckle as the 2014 Canadian Champion! November 6 | 9:00 a.m. – 12:00 p.m.
? Now in its fourth year, this has become one of the hottest competitions at Farmfair International! You’ll see four and five-year-old horses compete for $25,000 in prize money, with horses and riders coming from all three Western provinces and the United States. This is a judged event, and provides breeders and trainers with a unique opportunity to promote their horses to team roping enthusiasts from across Western Canada! November 6 | 5:00 p.m. – 7:00 p.m.
? New to the line up by popular demand, the Northlands Barrel Racing Futurity is open to any horse foaled in 2009/2010 and later (4 and 5 year olds). Futurity will be two go rounds and an average. Champions will be declared on their two run average. It’ll be a great race! November 7 | 11:00 a.m. – 12:30 p.m.
November 7 | 4:00 p.m. – 6:00 p.m.
? This is one of the most anticipated events of Farmfair! The Ranch Horse Sale features top working horses for today’s ranching community that buyers can take home and put to work on their own ranches with confidence. November 7 | 4:00 p.m.
? Bloodstock is a high calibre horse auction that brings together some of the top bloodlines, buyers and sellers in the industry; limited to 30 yearlings, two year olds and three year olds. This is a select sale giving buyers and sellers an opportunity to source great horses in one location. November 7 | 2:00 p.m. – 5:00 p.m.
? Roping competition for kids aged 11 and under. The overall champion is awarded a saddle. Event judged by Canadian Professional Rodeo team roping competitors. Enter online, deadline is October 20th.
? A fun and new twist on the Rodeo pageantry world. Searching for the Rodeo King of Canada. Proceeds will be donated to charity. November 7 | 10:30 p.m.
November 8 | 4:30 p.m. – 6:00 p.m.
November 9 | 10:00 a.m. – 12:30 p.m.
? Witness the extreme power and strength of the oldest farmhand out there as mighty teams hook to a weight-filled stone boat and pull. Some of the top teams will pull up to three times their own weight! Prior to the competition, sponsorship of each team is auctioned. This year, 10 per cent of the auction proceeds go to 4-H Foundation of Alberta.